What is the biggest threat facing your firm over the next few years? My firm recently asked this question in a survey of professional services firms and, as shown in Figure 1, found the eroding value of services was a consistent theme in five of the top seven threats. According to our findings, this trend in commoditization is being driven in part by increased competition from new and larger firms, which is creating downward pressure on prices and squeezing already low margins. We also learned firms believe the ongoing revolution in artificial intelligence and automation will only hasten the commoditization of many services that were once highly valued. 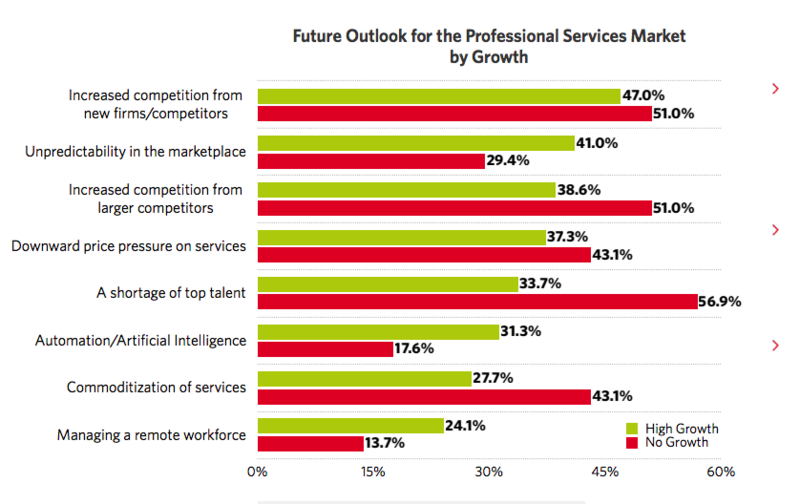 This finding would seem to be bad news for the world of professional services. After all, how will you get referral business when audiences feel there are cheaper, “good-enough” alternatives? There is good news for firms, however. But before we get to that, let’s take a fresh look at referrals. Experience-based — This is the kind of referral that is most familiar. It starts when a client has a good experience working with you. Later, someone asks that client for a recommendation of a firm that could do the same type of work, and they recommend you. Brand- or reputation-based — The sources of this type of referral are people who have never worked with a firm. Instead, they make the recommendation based on the firm’s perceived expertise or reputation in the marketplace. Referrals based on experience are limited by how many satisfied clients you have. Brand-based referrals, in comparison, have no such limits — that is, if you can learn how to get them. This is one reason that high-growth firms put so much emphasis on attracting brand-based referrals. What’s the common theme? Each of these sources is a way for firm to share its expertise. To avoid commoditization, your firm needs to employ one of the key strategies used by the fastest growing firms: give your expertise more visibility. Our findings show that firms whose expertise is visible generate 61 percent more referrals than they would attract based on their general reputation alone. The most practical method for increasing the visibility of your expertise is content marketing that spotlights your knowledge and ability to solve problems. That means working to educate anyone interested in your area of expertise about how you solve problems — and delivering this education at no charge. It also means finding multiple venues (both online and off) for your content — and using search engine optimization (SEO) techniques to ensure that your target audience can easily find you. When people start experiencing your expertise first-hand, they begin to develop trust, and consume more and more of your content. Eventually, when they need a service you provide, your firm’s name will be at the top of their list. In short, you will become synonymous (in prospects’ minds) with your area of expertise. It may sound like a bad idea to give away your hard-earned knowledge. I urge you to see the bigger picture, however, because the world has changed. Today, people expect that the information they want will be online — and also will be free. If you don’t share your expertise, someone else will. 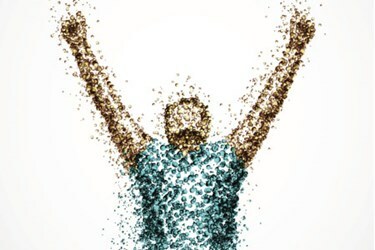 Being visible is essential to building a strong referral marketing program. But you also need one additional tool to avoid commoditization: something that distinguishes and differentiates your services and approach from those of other firms. Generally, this requires specialization — either in a specific industry or service area (read more about 21 methods for differentiating your firm). When clients look for experts, they naturally seek out firms experienced in solving their kinds of problems. And no one has experience that is more relevant than a specialist (which is why specialists can often charge higher fees). Facing a choice between a cheaper generalist and a more expensive specialist, most buyers will opt for what they think will be the safer choice: the specialist. By differentiating your firm, you provide people with a reason to select you over your poorly differentiated competitors. For more information on differentiation strategy and step-buy-step guidance for achieving it, check out this in-depth article. If you’re at all worried about competing in an increasingly commoditized marketplace, I have good news. You can do something to avoid it — but remember the old saying about the early bird getting the worm! To create a referral marketing strategy that can overcome the market forces driving commoditization, adapt your marketing program to focus on increasing your firm’s visibility and setting it apart in the minds of clients and prospects. Granted, this is no small feat. If you currently use a traditional approach to marketing — seeking face time with prospects, sponsoring events, and advertising for new business — get ready for a radical departure. You needn’t abandon everything you’re currently doing, but you will need to start exercising new marketing techniques and skills. Most of all, you’ll need to start thinking and acting less like a salesperson — and more like a teacher. Elizabeth Harr is an accomplished entrepreneur and experienced executive with a background in strategic planning, management, communications, and alliance development. Elizabeth cofounded a Microsoft solutions provider company and grew it into a thriving organization that became known for its expertise in Microsoft customer relationship management.